First you will need a piece of knit cotton. I cut my piece 60 inches long by about 12 inches wide. Fold it in half (length wise); Right side together. You now have 60 inches by 6 inches. Pin along the outer edge of the 60 inches. Sew it up with either a serger or your trusty sewing machine. Then turn it right side out so that your stitches are now inside. Now you are going to piece your ends together. Do this by putting one side inside the "tube" fold the edges of the outer tube under about one inch (make sure your inner tube is about an 1 1/2 inside the outer tube as well) and pin. If you do not wish to add any buttons, simply sew it up along the edge and you are done! If you are adding buttons pin it like this photo above. You will begin your first stitch about a half inch to an inch in from the folded over edge of your outer tube. This will make a little flap so that you can add your buttons; as you can see in the photo below. Now find some pretty buttons! Sew your buttons as close to the first seems as possible onto the flap. Now you can make your final seem by sewing on the outter edge of that flap, but be sure to move your buttons out of the way as you are sewing! For the COWL, just wrap it around your neck three times, and pull the button seem up so that it creates a cowl and tuck the extra scarf under. For the CLASSIC INFINITY SCARF, wrap around twice and adjust the button seem to suit your fancy. For both the HIGH-WAISTED BELT and the HIP BELT, just twist the scarf around you twice creating a cross in the back (like an X) and either pull it up under your breastbone or down over your hips! This is super simple and would make a pretty fun handmade gift, for yourself or someone else! Thanks Kristy! For a less complicated and no sewing machine method you could just cut you knit cotton 60x6 and leave raw edges, sew the two ends together using an old needle and thread with your buttons! I love this idea. The buttons really add pizazz. Very cute! I wish I was as talented as you - your creations are beautiful! want leisurely to tell what appointments or events belong to which calendar. Patch trustful shoppers, trying to eat healthily, volition be the losers. 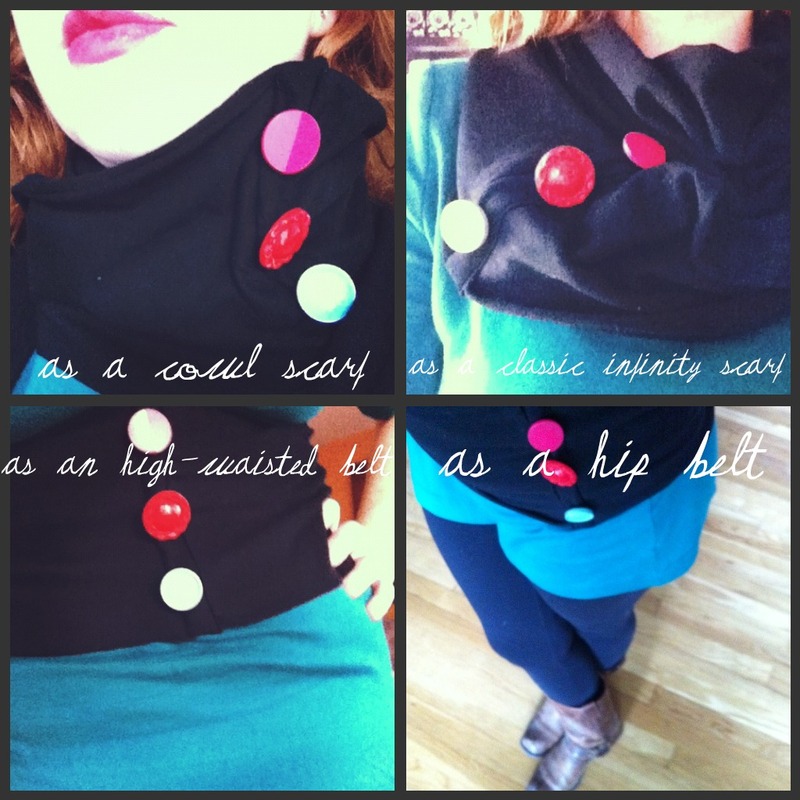 It is so nice to see your blog, as you used your infinity scarf in different purposes. Thanks for sharing, now I know; infinity scarf is not just a scarf to put across our neck, but it can be used as a belt too. Thanks again!